Moghaddam, Sadegh, Kamkar Rouhani, Abolghasem, Arab Amiri, Alireza. (1396). Subsurface structural characterization of the Chooman Dam site using geoelectric method. مجله ژئوفیزیک ایران, 10(5), 22-30. Sadegh Moghaddam; Abolghasem Kamkar Rouhani; Alireza Arab Amiri. "Subsurface structural characterization of the Chooman Dam site using geoelectric method". مجله ژئوفیزیک ایران, 10, 5, 1396, 22-30. Moghaddam, Sadegh, Kamkar Rouhani, Abolghasem, Arab Amiri, Alireza. (1396). 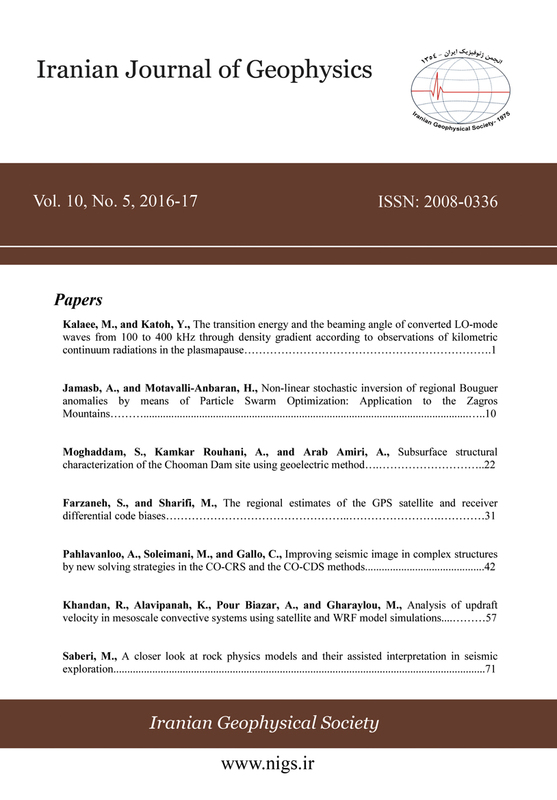 'Subsurface structural characterization of the Chooman Dam site using geoelectric method', مجله ژئوفیزیک ایران, 10(5), pp. 22-30. Moghaddam, Sadegh, Kamkar Rouhani, Abolghasem, Arab Amiri, Alireza. Subsurface structural characterization of the Chooman Dam site using geoelectric method. مجله ژئوفیزیک ایران, 1396; 10(5): 22-30. A recent evaluation of Chooman Dam highlighted the potential for dam failure due to either seepage or an earthquake on nearby faults. Unfortunately, this dam suffers from infiltration or leakage problems related mainly to different geological and tectonic factors. In response to these concerns, electrical resistivity surveys employing vertical electric sounding (VES) method were carried out at the dam site, located in Kurdistan Province in the west of Iran in order to delineate potential pathways of leakage occurring thorough the subsurface structure close to the dam body, bed rock depth and lateral discontinuities in the study area. The VES surveys were conducted using the Schlumberger electrode array in 400 points or stations along 28 profiles at a station interval of 20 to 50 m in up- and downstream sides of the dam embankment. For data acquisition, a terrameter SAS 4000 resistivity system, made by Swedish ABEM Company, was used. Maximum separation of current electrodes in the Schlumberger VES surveys was considered 430 m. These geoelectrical studies revealed a thick package of andesite basement in the eastern part and vitriform tuff basement in the western part of the study area. Considering the results and the detection of a strike-slip fault on the downstream side of the dam embankment, it is evident that fractures are the main causative factor responsible for the leakage in the Chooman Dam. Aina, A., Olurunfemi, M. O., and Ojo, J. S., 1996. An integration of aeromagnetic and electrical resistivity methods in dam site investigation: Geophysics, 61, 349–356. Banton, O., Seguin, M. K. and Cimon, M. A., 1997, Mapping field-scale physical properties of soil with electrical resistivity: Soil Science Society of America Journal, 61, 1010–1017. Batayneh, A. T., Abdallah, S. A. Z., and Abdelruhman, A. A., 2001, Geophysical investigations for the location of a proposed dam in Al Bishriyya (Al Aritayn) area, northeast Badia of Jordan: Environmental Geology, 40, 918–922. Bogoslovsky, V. A., and Ogilvy, A. A., 1970, Application of geophysical methods for studying the technical status of earth dams: Geophysical Prospecting, 18, 758–773. Bronner, N, Fagerström, H, and Stille H., 1988, Bedrock cracks as a possible cause of leakage in two Swedish dams: Proceedings of International Commission on Large Dams (ICOLD), 16th Congress, San Francisco, Q.61, R.55. Buselli, G., and Lu, K., 2001, Groundwater contamination monitoring with multichannel electrical and electromagnetic methods: Journal of Applied Geophysics, 48, 11–23. Butler, D. K., 1984, Geophysical methods for seepage detection, mapping and monitoring: SEG Expanded Abstracts, 3, 157–160. Cho, I.-K., and Yeom, J.-Y., 2007, Crossline resistivity tomography for the delineation of anomalous seepage pathways in an embankment dam: Geophysics, 72, 31–38. Egbai, J. C. and Asokhia, M. B., 1998, Correlation between resistivity survey and well logging in Delta State, Nigeria: Journal of the Nigerian Association of Mathematical Physics, 2, 163–175. Ezomo, F. O. and Akujieze, C. N., 2011, Geophysical study of limestone attributes at Abudu area of Edo State, Nigeria: J. of Emerging Trends in Engineering and Applied Sciences, 2, 795–800. Morgan, F. D., 2001, Self-Potential and Resistivity for the Detection and Monitoring of Earthen Dam Seepage: Massachusetts Institute of Technology, Department of Earth, Atmospheric and Planetary Sciences, Earth Resources Laboratory. Panthulu, T. V., Krishnaiah, C., and Shirke, J. M., 2001, Detection of seepage paths in earth dams using self-potential and electrical resistivity methods: Engineering Geology, 59, 281–295. Telford, W. M., Geldart, L. P. and Sheriff, R. E., 1990, Applied Geophysics: Cambridge University Press, London. Van Tuyen, D., Canh, T., and Weller, A., 2000, Geophysical investigations of river dikes in Vietnam: European Journal of Environmental and Engineering Geophysics, 4, 195–206. Voronkov, O. K., Kagan, A. A., Krivonogova, N. F., Glagovsky, V. B., and Prokopovich, V. S., 2004, Geophysical methods and identification of embankment dam parameters: Proceedings of the 2nd International Conference on Site Characterization (ISC), Porto, Portugal, 19–22 September, pp. 593–599.